Manchester United’s injury ravaged squad have been handed a timely double boost with the news that Antonio Valencia and Marcos Rojo have returned to training, the Metro reports. United currently have an astounding 13 players on the sidelines ahead of Thursday night’s Europa League clash with Danish side FC Midtylland and will likely have to field a number of players that featured against Shrewsbury on Monday. Valencia has been missing since he picked up a foot injury during October’s goalless draw with cross-town rivals Manchester City and wasn’t expected to be back in action for another month. 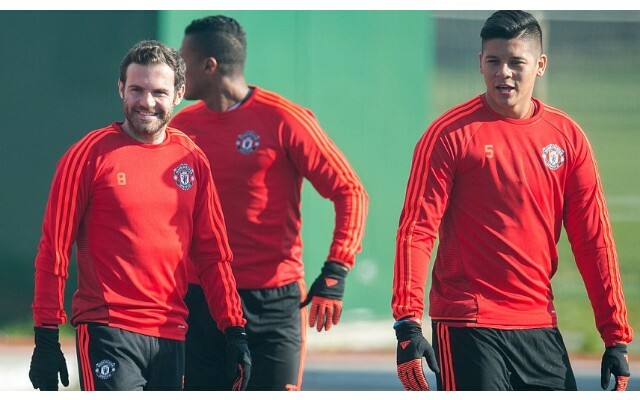 Rojo, too, was not tipped to come back for another two weeks but both players made their return to training this week. However, it is not known if either player will be fit enough to play a part in this week’s Europa League cruncher. Further news claims that both Chris Smalling and David de Gea could miss the game after sitting out training this week.